Godzilla: Planet of the Monsters (GODZILLA 怪獣惑星, Gojira: Kaijū Wakusei, also known as Godzilla Part 1: Planet of the Monsters and Godzilla: Monster Planet for short) is a 2017 Japanese computer-animated science fiction kaiju film featuring Godzilla, produced by Toho Animation and animated by Polygon Pictures, in association with Netflix. It is the 32nd film in the Godzilla franchise, the 30th Godzilla film produced by Toho, and the first animated film in the franchise. It is the first film in the anime trilogy and is co-directed by Kōbun Shizuno and Hiroyuki Seshita. The film was released theatrically in Japan on November 17, 2017, and released worldwide on Netflix on January 17, 2018. It was followed by two sequels, Godzilla: City on the Edge of Battle and Godzilla: The Planet Eater, released in Japan on May 18, 2018 and on November 9, 2018. In the last summer of the 20th century, giant monsters began plaguing Earth and humanity is driven to near extinction by one monster that eliminated the others: Godzilla. It was at that time that two alien races with ulterior motives, the religious Exif and the technologically advanced Bilusaludo, came to Earth to offer their assistance against Godzilla. But after the Bilusaludos' gambit with Mechagodzilla failed before it could be activated, both the aliens and humanity were forced to abandon Earth and emigrate to Tau Ceti e via the Aratrum. Among the humans is Haruo Sakaki, who bore a seething hatred towards Godzilla as his parents were killed during the exodus. 20 years later and 11.9 light years away from Earth, a fully grown Haruo believes Tau-e is uninhabitable and locks himself in a shuttle that he threatens to detonate unless the ship's committee resents the order for his grandfather and the elderly to scout the planet. But Haruo fails and is arrested, thrown in a cell where he witnesses the emigration shuttle explode while entering the planet's atmosphere. Provided classified data by an Exif priest named Metphies, Haruo anonymously publishes an essay detailing Godzilla's weak points to convince the central committee into returning to Earth once they conclude the unlikelihood of finding another habitable world. Upon returning to Earth, time having passed millennia due to relativist effects, the Aratrum sends recon drones to scout the Earth which reveal that Godzilla is still alive. Metphies orchestrates Haruo's bail so the human can explain to the committee that they can kill Godzilla, revealing a electromagnetic pulse-producing organ in Godzilla's body that generates an asymmetrical permeable shield that makes the monster impervious to all damage except for a small window when the organ recycles. Haruo proposes using that window to crack the shield organ and quickly shove in EMP probe before it regenerates to implode Godzilla from the resulting energy buildup. But Haruo stresses that close quarters combat would be needed for accurately coordinated attacks in order to find the organ, with the committee forced to deploy 600 people for Haruo's plan. When Haruo and the two battalions reach Earth, they learn that 20 millennia had passed on the planet with Godzilla's presence radically altering Earth's biosphere as they suffer losses and damage to their landing ships by Godzilla-like flying creatures called Servums. The company's commander Leland orders a retreat, but Metphies insists to rendezvous with Companies D and E through a pass within an area Godzilla frequents. The group mobilizes and soon encounters Godzilla. Haruo proceeds with the original plan on his own and attacks Godzilla before Leland intervenes and provoke Godzilla, his death allowing the others to learn Godzilla's weak point is its dorsal fins. Command falls to Metphies, who promotes Haruo to commander as the human convinces the remaining survivors to continue with the plan and defeat Godzilla. The group attacks Godzilla and manage to trap it within a collapsed mountain pass where succeed in killing the monster by once EMP probes drilled into its dorsal fins. Commenting after the apparent victory, the group's environmental biologist Martin Lazzari theorizes that this Godzilla may be different from the one that drove humanity away, believing it to be an offspring. Subsequently, the original Godzilla, which has grown exponentially to 300m in height, emerges from beneath a nearby mountain and destroys most of the remaining crew. Trapped beneath rubble, Haruo watches Godzilla leave while vowing to kill it before losing consciousness. In a post-credits scene, Haruo wakes up in a secluded area, finding an indigenous girl next to him. In August 2016, Toho announced that an animated Godzilla film was being developed, targeted for a 2017 release. Gen Urobuchi was announced as the writer, Kobun Shizuno and Hiroyuki Seshita as the directors, and Polygon Pictures was announced as the studio that would animate the film. In January 2017, Urobuchi announced the main cast on his Twitter account. In March 2017, Toho announced that the film would be the first film in a new trilogy. About the production, co-director Shizuno stated, "From the start, we had the blessing of Toho to not be constrained by previous entries in the franchise, and with the freedom of imagination offered by animation I feel we have come up with a cool new form for Godzilla." On Godzilla's new design, co-director Seshita stated, "With his masses of muscle fibers and unique body tissue to support his enormous bulk, this is an extraordinarily rugged-looking physique. It was an overwhelming presence that reverberated through the whole project, like a fearsome deity that even we who created it must prostrate ourselves before. That is our Godzilla." The English dub was produced by Post Haste Digital. Takayuki Hattori composed the film's soundtrack, marking it his third Godzilla film score. XAI performed the film's theme White Out. A stage event for the film was held at AnimeJapan 2017 on March 26, 2017. That same month, a teaser poster revealed that the film will be released theatrically in Japan on November 17, 2017. The film's directors attended the Annecy International Animation Film Festival to reveal more details regarding the film. In June 2017, a new poster detailing Godzilla's design was revealed with the tagline "Despair Evolves". In August 2017, a new trailer and poster were released with the tagline "Who will go extinct — humans, or Godzilla?" Godzilla: Planet of the Monsters was given a theatrical release in Japan on November 17, 2017. In March 2017, it was announced that the film will be streamed in 190 countries via Netflix following the film's Japanese theatrical release. Greg Peters, President of Netflix Japan stated, "Working with the best creators such as Toho in bringing Godzilla to Netflix users in over 190 countries marks a major milestone for us". In January 2018, Netflix announced that the film will be released worldwide on their platform on January 17, 2018. Godzilla: Planet of the Monsters reached #3 at the Japanese box office on its opening weekend, earning ¥103 million from 71,200 admissions within two days. By its third weekend, it had grossed ¥342,349,800 ($3,052,062). Upon its Chinese release in 2018, the film grossed CN¥1.62 million ($239,645) at the Chinese box office, bringing the film's total box office gross to $3.3 million in East Asia. Brian Ashcraft of the Kotaku website felt that the characters "aren’t all that interesting" but did state that the "anime version of Godzilla is surprisingly effective and frightening" and that despite his complaints, the "overall experience was good" and "It’s not a perfect picture, but it was a powerful proof of concept: Godzilla works as an anime." Matt Schley from The Japan Times praised the film's CG animation, stating, "even skeptics will admit the 3-D version of the king of the monsters looks pretty darn cool" but felt the film wasn't "nearly as thematically ambitious as its predecessor" and concluded by stating, "But still, with its impressive 3-D animation and action sequences, 'Planet of the Monsters' has the makings of something interesting." Callum May from Anime News Network gave the film an overall B+ rating, calling the film "not for the uninitiated". May criticized the character of Haruo as being "grating", as the film didn't allow audiences to connect with other characters but praised the animation, call it Polygon's "best-looking CG title yet" and concluded that the film "is a thrilling film that lives up to the reputation of the franchise and delivers on its science fiction premise". Mike Cecchini from Den of Geek felt the film was "beautifully animated" but criticized the characters, feeling they weren't sympathetic or well-developed. He also felt the technological dialogue felt more like it came from a video game but concluded by stating, "But Planet of the Monsters is just so damn gorgeous to look at, and such a complete departure from what you usually expect from this world, that you should just take it all in and enjoy the surprises." Patrick Galvan from Syfy Wired called the film "dull", criticizing the lack of human drama, the poorly developed world-building, and the writing, stating, "the writing is sadly not strong enough to even work on its own terms." He concluded by stating, "With a more polished script, Godzilla: Planet of the Monsters might've been something of a modern classic. As is, it's a largely dull, impersonal product with only a few bursts of genuine interest to its name." Jonathan Barkan from Dread Central gave the film 2 stars out of 5, feeling that the film has "great potential" but is "bland". He criticized the characters as being "forgettable", the film's was lack of exploring its "imaginative opportunities", called the animation's color scheme "flat and uninteresting" and felt some of the action scenes were too shaky. He concluded by stating, "Suffice it to say that it definitely has me interested in the second and third films but I really hope that this new world will be explored further in those entries. Otherwise, we’ve got a fascinating foundation that will be squandered." Paul Thomas Chapman from Otaku USA called the film a "train wreck". He criticized the film for dedicating various scenes to "nonstop barrage of technobabble and exposition" and criticized the character development for not exploring the inner lives of other characters. He concluded by stating the film "is not an easy film to recommend to either casual fans or to battle-hardened kaiju otaku. But despite its (many, glaring) flaws". Despite his criticism, Chapman "enjoyed" the film regardless. In Japan, the film was released on DVD and Blu-ray by Toho Video on May 16, 2018. It sold 5,813 Blu-ray units within its first week, and 1,784 DVD units within two weeks. 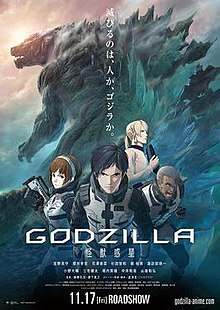 Godzilla: Planet of the Monsters is the first film in the anime trilogy. The second film in the trilogy, titled Godzilla: City on the Edge of Battle was released on May 18, 2018. The third and final film in the trilogy, titled Godzilla: The Planet Eater, was released on November 9, 2018. ^ Knight, Rosie (March 7, 2018). "Godzilla Anime Reveals Radical Sequel Concept Art". Nerdist. Retrieved April 28, 2018. ^ a b "Japan Box Office, December 2–3, 2017". Box Office Mojo. Retrieved February 11, 2019. ^ a b "哥斯拉：怪兽行星 (Godzilla: Monster Planet)". Maoyan. Retrieved February 11, 2019. ^ a b c "Godzilla: Planet of the Monsters Press Notes from Toho". SciFi Japan. July 30, 2017. Retrieved July 30, 2017. ^ a b c "Godzilla: Planet of the Monsters Now Streaming Worldwide on Netflix". SciFi Japan. Retrieved January 17, 2018. ^ Muncy, Julie (January 7, 2018). "Get Ready For the Ultimate Kaiju Battle With This Godzilla: Monster Planet Release Trailer". io9. Retrieved February 3, 2018. ^ Grebey, James (January 18, 2018). "'Godzilla: Monster Planet' Is an Anime First, Godzilla Movie... Maybe Third". Inverse. Retrieved February 3, 2018. ^ a b c "Gen Urobuchi's Godzilla Anime Film Reveals 6 Main Cast Members, Concept Art Image". Anime News Network. January 19, 2017. Retrieved January 19, 2017. ^ "Godzilla Anime Films Cast Daisuke Ono, Kenta Miyake, Kenyuu Horiuchi, Kazuya Nakai, Kazuhiro Yamaji". Anime News Network. August 15, 2017. Retrieved August 15, 2017. ^ @suzaki_aya. "Aya Suzaki Twitter". Twitter. Retrieved November 17, 2017. ^ Ragone, August (August 18, 2016). "Toho Gears Up First Godzilla Anime Movie From the Makers of Gargantia & Sidonia". The Good, the Bad, and Godzilla. Retrieved August 18, 2016. ^ "2017 Godzilla Anime Film Penned by Gen Urobuchi, Animated by Polygon Pictures". Anime News Network. August 18, 2016. Retrieved May 14, 2017. ^ a b "Godzilla Anime Is Film Trilogy Starring Mamoru Miyano". Anime News Network. March 21, 2017. Retrieved March 27, 2017. ^ Komatsu, Mikikazu (March 24, 2017). "2nd Teaser Visual, Story Setting for "Godzilla: Monster Planet" Anime Film Revealed". Crunchyroll. Retrieved March 24, 2017. ^ Julian, Mark (June 5, 2017). "More Details About Netflix's Godzilla Anime Trilogy To Be Unveiled At Upcoming Animation Film Festival". Anime Mojo. Retrieved June 12, 2017. ^ ""Godzilla: Monster Planet" 3rd Teaser Visual Shows The Biggest Godzilla in History". Crunchyroll. June 13, 2017. Retrieved June 14, 2017. ^ "1st Godzilla Anime Film's Trailer Unveils New Head Design". Anime News Network. August 16, 2017. Retrieved August 17, 2017. ^ Gilyadov, Alex (March 13, 2017). "Netflix to Air Original Anime Movie, Godzilla". IGN. Retrieved March 13, 2017. ^ "Godzilla Anime Film to Stream on Netflix Globally This Year". Anime News Network. March 13, 2017. Retrieved March 13, 2017. ^ Muncy, Julie (January 7, 2018). "Get Ready For the Ultimate Kaiju Battle With This Godzilla: Monster Planet Release Trailer". Gizmodo. Retrieved January 8, 2018. ^ "1st Godzilla Anime Film Debuts at #3 at Japanese Box Office". Anime News Network. Retrieved November 21, 2017. ^ "Live-Action Fullmetal Alchemist Film Tops Japan's Box Office". Anime News Network. December 5, 2017. Retrieved February 11, 2019. ^ Ashcraft, Brian (November 17, 2017). "The New Anime Godzilla Movie Is Pretty Good". Kotaku. Retrieved November 17, 2017. ^ Schley, Matt (November 15, 2017). "'Godzilla: Planet of the Monsters': Japan's main mutant gets animated and goes global". The Japan Times. Retrieved November 17, 2017. ^ May, Callum (January 17, 2018). "Godzilla: Planet of the Monsters - Review". Anime News Network. Retrieved January 11, 2019. ^ Cecchini, Mike (January 17, 2018). "Godzilla Anime Review: Planet of the Monsters". Den of Geek. Retrieved January 11, 2019. ^ Galvan, Patrick (January 18, 2018). "Godzilla: Planet of the Monsters Review: Netflix Anime has Easter Eggs, Little Else". Syfy Wire. Retrieved January 11, 2019. ^ Barkan, Jonathan (January 17, 2018). "Godzilla: Planet of the Monsters Review – A Timid Step Towards a Frightening Possibility". Dread Central. Retrieved January 11, 2019. ^ Chapman, Paul Thomas (May 5, 2018). "Godzilla: Planet of the Monsters [Review]". Otaku USA. Retrieved January 11, 2019. ^ Squires, John (February 27, 2018). "Toho Video Releasing 'Godzilla: Planet of the Monsters' On DVD & Blu-ray". Bloody Disgusting. Retrieved May 19, 2018. ^ Loo, Egan (May 22, 2018). "Japan's Animation Blu-ray Disc Ranking, May 14-20". Anime News Network. Retrieved February 11, 2019. ^ Loo, Egan (May 29, 2018). "Japan's Animation DVD Ranking, May 21-27". Anime News Network. Retrieved February 11, 2019. ^ Schilling, Mark (November 16, 2017). "Toho to Make Second and Third 'Godzilla' Animation Movies". Variety. Retrieved November 16, 2017. ^ "2nd Godzilla Anime Film Teases Mechagodzilla Before May Debut". Anime News Network. November 11, 2017. Retrieved November 24, 2017. ^ Barkan, Jonathan (May 17, 2018). "Posters Suggests Ghidorah Coming to Godzilla Anime". Dread Central. Retrieved May 18, 2018.